What Is A Design Lab? Why Use One? Design thinking is a set of principles that includes—empathy with users, a discipline of prototyping, and tolerance for failure. It is a useful technique for creating a more responsive, flexible organizational culture as well as coming up with more innovative ideas for programs and grants that are a good fit. Over the past twenty years, the Brainerd Foundation has invested nearly $50 million in organizations working to protect the environment in the Northwest. In 2020, the foundation will close its doors. As part of its sunset strategy, the foundation is developing an initiative to support 21st Century Advocacy. 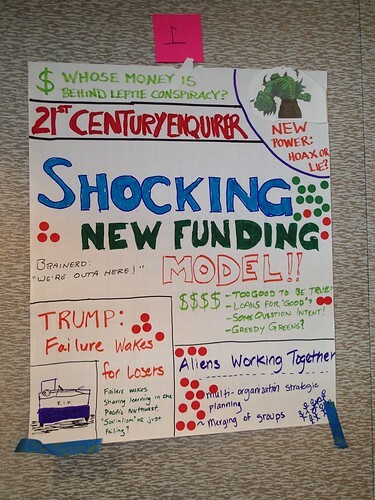 How can the Brainerd Foundation and its philanthropic partners accelerate the transition to 21st Century advocacy for grantees? What investments can the Brainerd Foundation make over the next five years to help build an effective infrastructure of advocacy that builds power for conservation that will endure beyond the foundation’s sunset? As part of the context setting, participants were tasked to do “active listening,” taking note of a strengths, challenges, and opportunities in what the speakers shared. I facilitated the discussion with the design lab participants and experts. 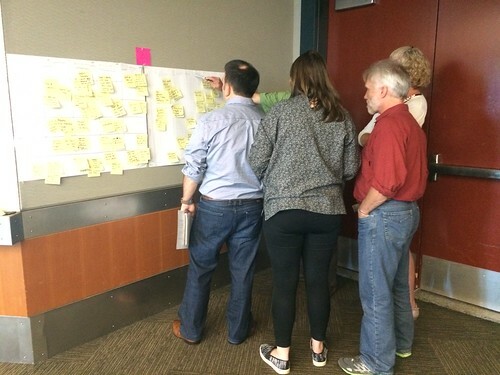 The key insights were captured and tweeted by Nicole Lampe and are gathered in this Storify. Notes from the presentations as well as photos can be found here. The context setting kicked off the lab’s first half-day. The next morning participants gathered to make individual and collective sense of the ideas that were shared by experts. The techniques that help you get at understanding are not always fun or easy to do. It requires stepping back and seeing the big picture. The first technique I used to get at individual understanding of the design challenge. 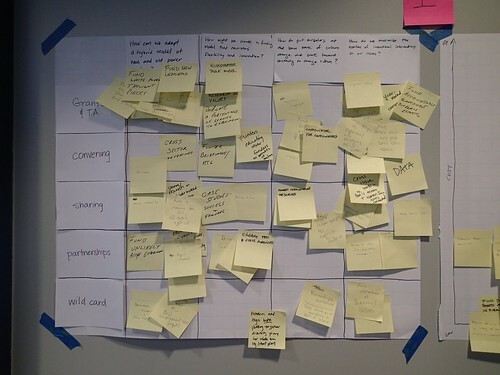 It is called “Rose, Bud, Thorn.” Participants reviewed their notes from the expert sessions, and wrote down challenges on blue sticky notes, strengths on pink sticky notes, and opportunities on green sticky notes. To generate group or collective understanding, I facilitated a cluster or affinity analysis of the different themes. 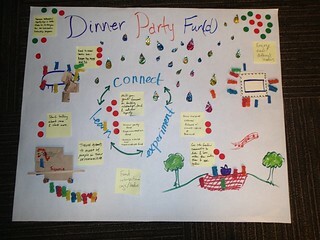 After we had all the sticky notes on the board, we had generated a landscape analysis from the grantee’s point of view. How might we adopt a hybrid model of new and old power? 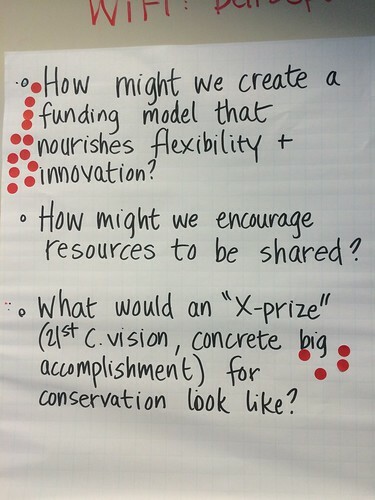 How might we create a funding model that nourishes flexibility and innovation? How might we reimagine our goals so they aren’t trapped by old power values and/or culture? How might we better invest in young people and/or other key folks so they stay in the movement? How might we experiment with organizational restructuring or deconstructing? How might we be complicit in preserving power or dispersing it? How might we create a culture of sharing and listening that is less prescriptive? This part of the process is the most because everyone gets to unleash their creative thinking. We had participants work in small teams using a structured brainstorming approach called the “Creative Matrix.” They got to select or create brainstorming questions for each column and using sticky notes generated ideas for different components of the strategy such as grants/technical assistance, convenings, partners, and sharing. To get people in the mindset for brainstorming, I lead them through a couple of improvisation exercises that teach acceptance and openness to new ideas. 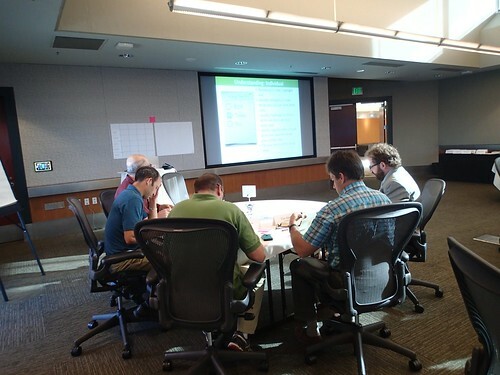 The next step in the process was for participants to evaluate some of the ideas using a 2×2 called the importance/difficulty grid. This helped each team look at the ideas in terms of the cost and impact and prioritize what they thought were some of the best ideas. This approach focuses on listening and looking at the infrastructure and DNA of the conservation community with humility, imagination, and curiosity. The Brainerd Foundation would follow and fund the ideas of new leaders. 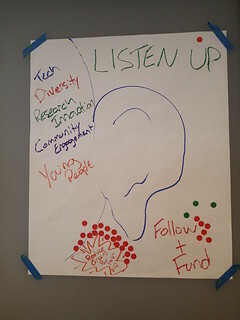 After projects were funded, we’d continue the virtuous circle by returning to listening mode. Funding for these new initiatives and projects would be freed up by reducing the number of greens by half, recognizing that you can’t solve a problem with the same thinking that got you into it. This approach would also create capacity for new voices and new ideas to be engaged in the environmental movement. 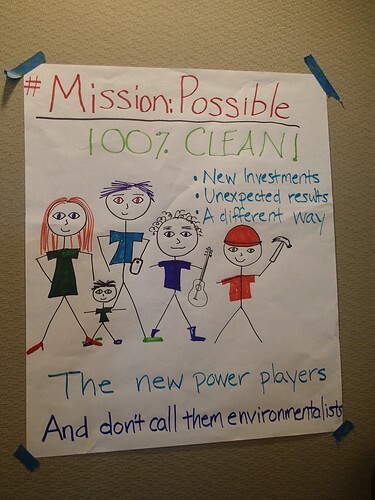 Mission: Possible focuses on a 100% clean power future achieved by investing in a new set of power brokers: moms, artists, workers, and communities of color who care passionately about the futures of their communities and are working together to achieve a safer, healthier, more prosperous Northwest. The Brainerd Foundation would invest in these individuals and demonstrate sharing and dispersing power, by supporting leadership development, campaigns, and strategies where a deep investment in diverse, multi-generational communities could bubble up. These new leaders wouldn’t self-identify as environmentalists, but would be motivated to continue driving victories for their communities. New investments by the foundation would trigger new investments by other funders around the region. 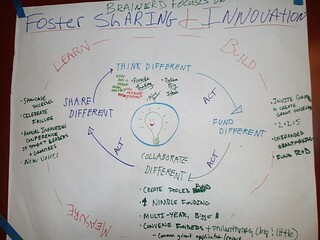 In this approach, the Brainerd Foundation would focus on fostering sharing and innovation by thinking differently, funding differently, collaborating with other funders differently, and sharing differently—all starting tomorrow. The foundation would provoke new thinking by defining big ideas, contemplating what a new/old hybrid power model might look like, and evaluating whether nonprofit boards of directors are useful or just in the way. The foundation would fund differently by bringing grantees to the table to develop grantmaking guidelines, offering un-branded grantmaking to coalitions, and providing funds for research and innovation. Collaborating more with other funders would led to the creation of a pooled fund, more multi-year funding, a common grant application, and the ability to be more nimble. Sharing what we’re doing and learning would expand the impact more broadly; we could convene an annual gathering to showcase successes, share failures and create a space for grantees and funders to build, measure, and learn together. This concept responds to the question: “How do we develop a funding model that nourishes innovation and flexibility?” The answer centered on the idea of a revolving loan program (“loans for good”) with the Brainerd Foundation giving loans (rather than grants) for organizing that is monetized and can be repaid. This concept also included groups from different sectors doing long-term strategic or campaign planning together, with some groups daring to merge. Groups would also get together to discuss failures and lessons learned, so the broader community can be more successful. This approach centered on a vision of diverse, powerful people living in a vibrant and healthy natural environment brought to life by a shift in culture. To this end, the Brainerd Foundation would reach beyond the usual suspects to listen to the needs and ideas of people in the environmental and social justice movements, and bring in new people and approaches via a “find them and fund them” strategy. New power and old power leaders would have opportunities to learn from and mentor each other. And nonprofit staff would receive cross-cultural exchange grants to be temporarily embedded (1–2 weeks) in another organization from different sectors or regions where they would develop new skills and knowledge while helping another organization with a campaign or project. The dinner party concept responds to the question: “How do you leverage the “rain” of cultural changes?” A series of dinner parties would create space to bridge the personal and professional, build new relationships, and have conversations that we can’t have in other settings. Mindful of the power dynamics of inviting other people to our tables, this fund would be flexible, providing resources for conservationists to spend time in the community, so they could connect without an agenda and without wearing their organizational hats. This fund would focus on creating opportunities to hear from young leaders, diverse communities, and prospective allies. It would be nimble and able to fund spontaneous dinner parties quickly, providing funds to both individuals and nonprofits. The Brainerd Foundation would also host more formal dinners to both model and encourage the type of behavior it hopes to fund, learn from, and encourage in others. These dinner parties would inform the rest of the foundation’s funding by serving as an incubator to spark and experiment with new ideas. Finally, we used sticky dot voting to identify which details and overall concepts resonated the most! We finished with a group photo and fun co-creation reflection. Of course, creating a funding investment strategy is not the end result of a design lab, but improving the impact of a strategy by getting feedback from others is. The Brainerd Foundation staff is taking the rich documentation and ideas and incorporating into their program strategy and plan. 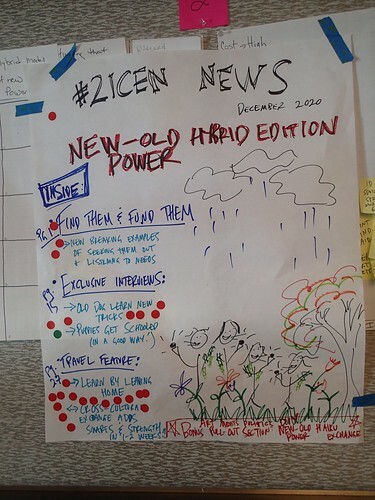 Design thinking began as a way to improve to improve consumer products, but this example and others like it show that design thinking principles have the potential to be even more powerful when applied to social change or big challenges involved in grantees to engage with and adopt innovative new ways of working, like 21st Century Advocacy. Is your organization using design thinking to get feedback from program stakeholders, get new ideas, or help change your organization’s culture? What has your experience been?